Thanks to Tom and Janet Brownlee, Affordable Portables has been a sponsor of CL Access Lottery Calendar for several years. Their ongoing support of Community Living Access has been amazing. Affordable Portables was established in 1992. As true leaders in their field, Affordable Portables has earned the reputation of providing clean, modern, and professionally delivered & serviced portable toilets. 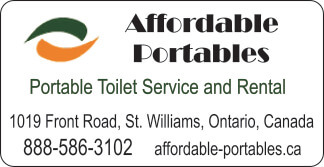 Regardless of your sanitation needs, Affordable Portables has the products you need! For a Full List of Services visit their website below! CL ACCESS has been using the AIMS® Database as our Case Management System for several years. The transition from paper to online record keeping was seamless, due in no small part to Brent Buchwald, the mind behind AIMS®. CL ACCESS is excited to add AIMS® as one of our new sponsors. “When we first began developing AIMS®, we were looking to provide organizations with a powerful tool that could help them quantify the fantastic work that they were doing on a daily basis. For more information on AIMS and their Full List of Services visit their website below! For Full Wash and Detailing Options call 226 567-8299 or visit their website URL below. Their ongoing support of our agency and the community at large truly makes a difference. Click on the website Link Below to find out more! Gary Hepburn has been instrumental in consulting and providing CL ACCESS with our Agency Benefit Plan for many years. Gary’s willingness to support and advocate on behalf of our agency’s Mission and Goals is reflected in his recent sponsorship. Cowan Insurance Group is a preeminent Canadian insurance brokerage and consulting operation, representing national and international insurance companies. Cowan provides insurance and risk management for businesses, organizations and individuals; advises and creates retirement, group benefits and disability management programs for employee groups; and offers wealth management, financial and succession planning services to individuals. For a Full List of Services visit their website below! Lead by George Karamilev, Domino’s Pizza is a business that truly invests and supports the community they serve. George’s support of CL Access has been astounding, whether supporting our agency through their Pizza Box Topper of the Month campaigns’, sponsoring and helping to sell our Lottery Calendars, and providing prizes and other supports, George and his Team has been there for us whenever we have asked. “We will prepare everything fresh for you for carryout or delivery to your Simcoe area home or business location”. We offer more than just pizza delivery, the team at Domino’s Pizza services the Simcoe area with all of their pizza, chicken wings, chocolate cake and other delicious lunch or dinner choices. You can even order on-line. Are YOU Hungry – Order Now Click on the website Link Below to find out more! Kristina and her team have been regular sponsors of CL Access Lottery Calendar for several years. Their ongoing support of Community Living Access Calendar Programs has been an important part of our calendars success. 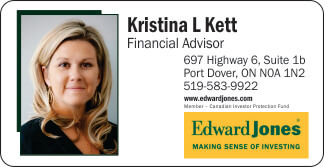 Kristina started working in the Wealth Management industry over ten years ago as a Financial Advisor at Scotiabank Port Dover and in 2010 she transitioned to Edward Jones. The draw to serve her clients through Edward Jones was founded in the firm’s unrelenting commitment to client service and satisfaction. For a Full List of Services visit their website below! Gallagher Insurance – Canada Ltd.
Gallagher’s have been long time consultants to our agency, helping us manage our Cooperate Insurance needs, ranging from Liability, Vehicle, Tenant Insurance etc… CL ACCESS are excited that Gallagher Insurance has joined our Sponsor Family. Arthur J. Gallagher founded the company in 1927 and built it based on passionate service, teamwork and ethical behaviour. These values are core to their culture and remain the foundation of their business today. For more information and their Full List of Services visit their website below! We are excited to welcome Len Herrewynen and his team as part of our sponsorship team. Their family owned businesses have had an incredible impact on familes and communities throughout Norfolk County. In this day and age, it’s rare for a family business to be serving the community for over 40 years. 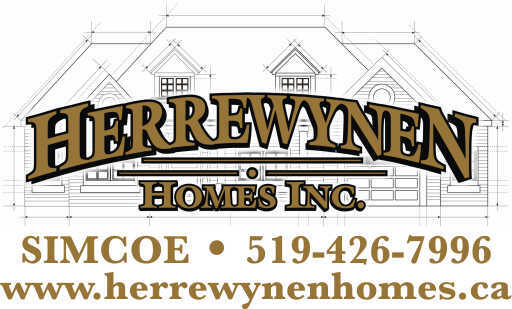 The Herrewynen’s never imagined the impact their family business would have on the community, but now, hundreds of custom-built homes later, the Herrewynen family is enjoying the good name they’ve built for themselves. They are “quality conscious and so are their subcontractors”. “They know what we expect and that is the best. For a Full List of Services visit their website below! 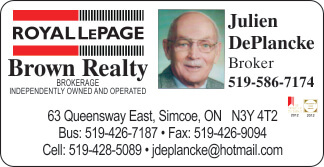 We are pleased to welcome Jeff Freeman and his team as part of our sponsorship team. Their family owned business has been taking care of your car’s tire and wheel’s needs for years. Their commitment to provide their customners with quality service and products is why their business has thrived in Norflk County. Kal Tire is a Canadian based business and one of Canada’s largest independent tire dealers. Visit Kal Tire – Freeman’s Service Centre at 609 Norfolk St N, Simcoe, for your tire, wheel/rim, mechanical service, oil change and alignment needs. For a Full List of Services visit their website below! Knechtel Foods have been regular sponsors of CL Access Lottery Calendar for several years. Their ongoing support of Community Living Access Calendar Programs has been an important part of our calendars success. Since the 1950’s, Knechtel Foods have been providing local folk, national and international tourists with outstanding hospitality, exceptional service, and delicious food! 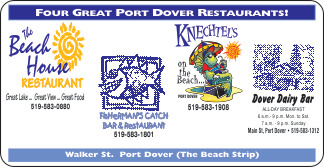 they represents: “Knechel’s on the Beach”, “Fisherman’s Catch Bar & Restaurant”, “The Beach House” and the “Dover Dairy Bar” Click on the website Link Below to find out more! CL Access has benefited from long standing support and has a wonderful partnership with Gary & Heather and the Koncir family for years. Koncir Automotive has supported our agency through the purchase and services of the agency’s vehicles and various sponsorships. Check out our new web page called EYE on Business, which profiles Koncir Automotive and outlines the incredible support we recieve from Gary & Heather. Their ongoing support of CL ACCESS is amazing. 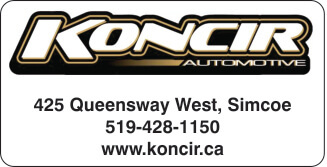 Koncir Automotive – “Where quality service is yours” from a quality equipped shop to the personally selected vehicles on the lot. Gary and his TEAM treat the needs of each individual customer with the upmost concern. They know that you have high expectations as a customer, and they will strive to meet and exceed those standards each and every time. Allow Koncir to demonstrate their commitment and high Standard of Excellence to you. Click on the website Link Below to find out more! Libro offers fast, convenient access to a full range of financial products and services – everything you’d expect from your financial institution. What you might not expect is our personalized Coaching. When you choose to partner with Libro, our Coaches work with you to help you achieve prosperity, however you define it. As a financial co-operative, Libro customers are Owners. Because you’re an Owner, you have opportunities to impact our organization, and receive an individual share of our profits annually. Ownership has its rewards! Click the Link Below to find out more! CL ACCESS is excited to welcome a unique Barber Shop experince right here in downtown Simcoe. The Team at Menz Den II Barber Shop – Simcoe in conjuction with the Embrace Hair Salon & Spa in Waterford have not only sponsored our Lottery Cash Calendar but through their Staff at the Waterford location sold our 2019 Lottery Calendars. We look forward to their ongoing support in what will be an hair raising experience! “Menz Den II Barber Shop…. Is truly a unigue hair cutting barbershop. Men also need to be pambered, as soon as you step into their shop you not only feel welcomed but their “Great Vibe, Great Service & Great Cuts will help “unleash the true man in you”. So be sure to join them for a cut, shave, beard or beer. For more information on Menz Den II and their Full List of Services visit their website below! 2019 BRONZE Sponsor for our 2019 Lottery Calendar. Since 1991 CL ACCESS has been fortunate to have the guidance and support of talent proffessional accountants from the Millard’s team. Their understanding of the challenges and complexities faced by Not-For-Profit agencies has provided the expertise instrumental in our success. Their ongoing support of our agency, their sponsorship and their involvement in our community at large truly makes a difference. Millards (formerly Millard, Rouse & Rosebrugh LLP) has a long and rich history of helping their clients to navigate successfully through the turbulent waters of financial well-being. Millards is one of Canada’s largest accounting firms with a qualified contingent of Partners, Associates, Senior Accountants and Client and Internal Support Staff. Whether you need personal tax help like tax planning and estate planning or you represent a company or organization that requires experienced and strategic accounting services lke auditing, business tax planning, SR&ED or valuations, Millards brings a team approach to the business of your business. For a Full List of Services visit the their website below. Their caring and support of organizations throughout Norfolk is reflected in the quality of service and their commitment ensuring the highest quality and incredible selection of footwear for their customers in Norfolk County. Like them on their Facebook Site Link Below to find out more! 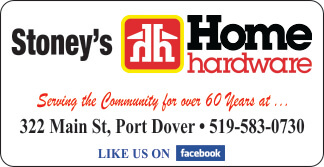 2019 Bronze Sponsor for our Lottery Calendar..
Their Port Dover Apothecary conveniently located at 328 Main Street, is proud to service the Port Dover area. 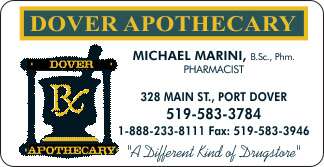 They are Port Dover’s only family-owned, independent pharmacy! We are very proud to serve and support our local community! For a Full List of Services visit their website below! 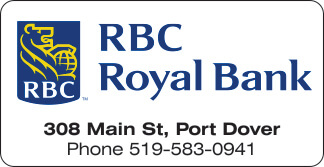 Port Dover Maple Leaf is a strong supporter of Agencies that provide community servcies throughout Norfolk County. CL Access has benefited from the many servcies offered by PD Maple Leaf. For example, our Lottery Calendar design, creative conception and production are a few of the elements that were provided by PD Maple Leaf. 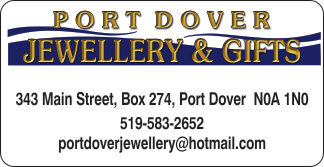 Portdovermapleleaf.com, is run by Port Dover’s community newspaper – Port Dover Maple Leaf. The Maple Leaf has been reporting the news of Port Dover to residents in a print format since 1873 (yes, that’s 1873). The printed newspaper continues, but we are now able to share the news of our community with the world at our website. Be sure to view all the services they provide the Business community. Click on the website Link Below to find out more! 2019 Lottery Calendar Page Sponsor. Their community involvement is well recognized throughout the county. CL Access has a wonderful partnership with The Tan-Mar Shoppe in Port Dover. They have helped our agency sell our Lottery calendar for several years and in 2019 we were pleased to have Tan-Mar join our Sponsorship Team. Tan-Mar was established in 1985 and is known for its One-Stop Shop for your Stationary, Cards, Books, Hobbies and of course Dry Cleaning Needs as a Peerless Dry Cleaning Agent. Visit Tan-Mar at 347 Main St. Port Dover. Since the company’s inception in 1954, the commitment to considering the interests of all stakeholders has been instilled into our foundation. From our roots in agriculture markets to the expansion of our landscape and golf division, it is our strong belief that this commitment has played a major role in the success of Vanden Bussche Irrigation. Click on the website Link Below to find out more!